Just when you thought all that was left on television was reality shows and either Law and Order or CSI, along came a little show called Heroes. Oh, it's not for everybody, but for the geeks in the crowd, it was a breathe of fresh air. As expected, there had to be action figures. Let's face it, anything that becomes remotely popular seems to require some form of mini-idol, either in articulated 'action' form or in the currently more popular statuesque 'Nerd Hummel' form. When this is driven merely by the popularity of the show/movie/game, it's often a bad idea. 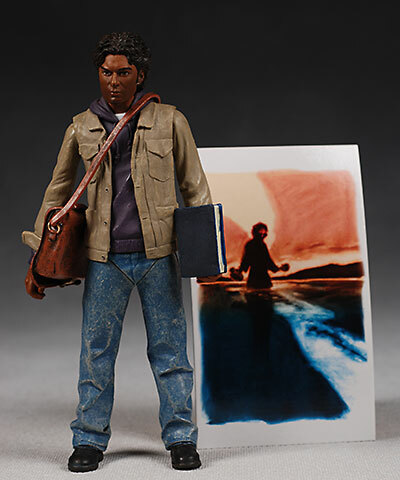 Sure, Lost has 15 million viewers, but how many of them are pop culture collectible nerds? A show's demographics needs to match up with the demographics of a product's buyers, otherwise it's not a good fit. 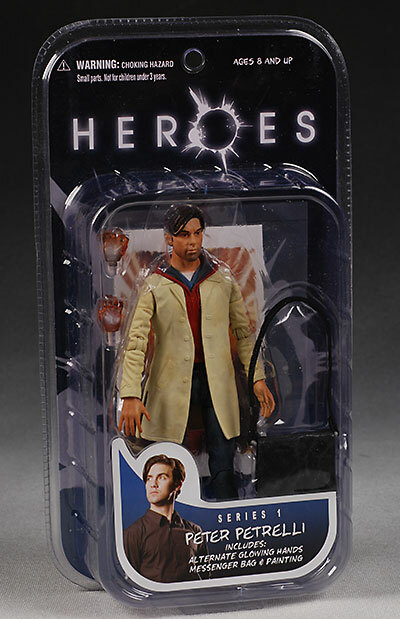 Heroes is an excellent match with us pop culture/action figure types. Many of the people that watch the show will also be the type that buy such products, as long as they know such products exist. Mezco picked up the license to do Heroes collectibles, and their first series of action figures has hit the pegs at Toys R Us. This first series includes Claire, Peter, Hiro, Mohinder and Sylar. They retail for around $12 each, and as I said, you may find them at your local TRU, or pick them up for sure at one of the sponsors I have listed at the end of the review. There are also a number of exclusives already announced. Toys R Us has two exclusives - a toasty Fire Rescue Claire, and Time Square Teleport Hiro. Wizard World Chicago will have two variants of Peter - one completely clear ('invisible'), and one partly clear, partly painted ('phasing'). 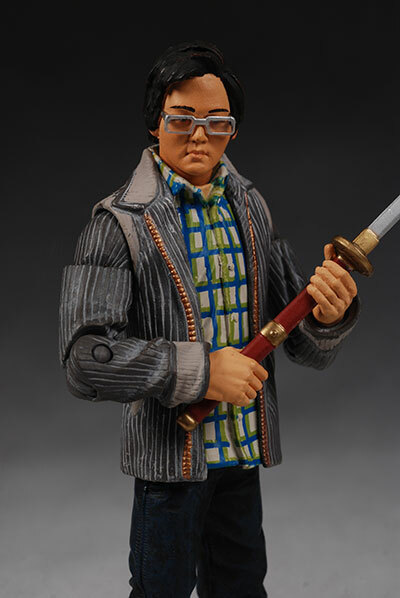 Mezco will also have a Future Hiro exclusive at several cons (including SDCC) and at their own site. And Diamond should have a 'flight mode' Peter Petrelli as well. There have been photos and rumors of a number of other exclusives, but these are the ones I know of that are confirmed right now. These come clamshelled, but the clamshell shape and style is more like the standard sized cardback package than the Mcfarlane or NECA clamshell. They open easy enough if you carry a machete, but the store extremely well and stand up to peg wear great. The graphics on the insert are good, but there's no personalization. The only place that's specific to this character is the front bubble sticker, but at least all the accessories are listed so you know what's what. Are these 'stylized'? I'm not sure. Some are clearly more caricaturish than others...but that might not be intentional. If the entire wave had that carnival painting look to them, I'd think it was planned but only a couple of them really do, so I'm confused. 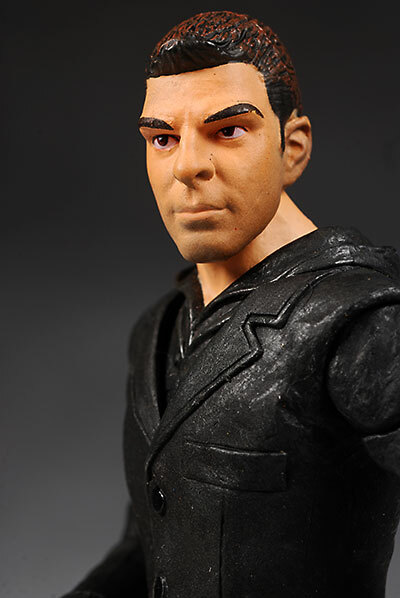 Sylar is the head sculpt with the most extreme appearance. Yes, his head really is that big compared to his body, and yes, the various parts (nose, chin, jaw) really are that proportionally large. He seems the most out of sync with the rest of the series, style-wise, but I can tell who it's supposed to be. It seems like the sculptor took his more extreme facial features and used these to accentuate who this is, but stepped over that line into cartoony proportions. His body sculpt is good, although a little out of scale with the other figures, at least from memory. He's just about 7" tall, the same as Peter and Mohinder, with a very thing body. 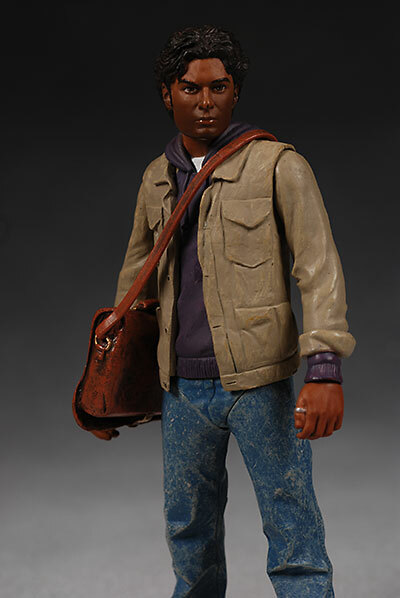 The coat over the hoodie is nicely sculpted, and his hand sculpts work pretty well with the included accessories. He stands great on his own as well, always a plus. 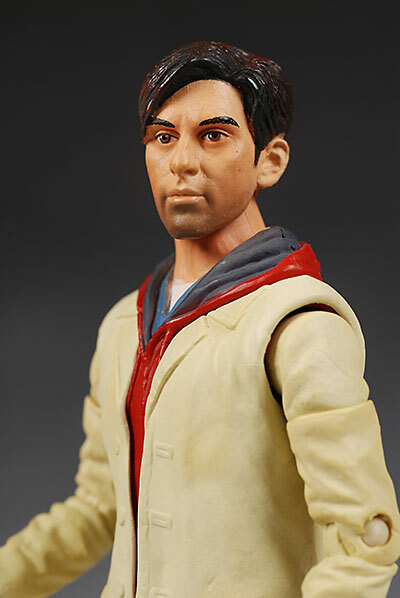 Peter is also a bit cartoonish, but unlike Sylar, it's harder to tell who this is supposed to be. Again, the head is large for the body, and the eyes, nose and head shape just don't look like the Peter Petrelli I know from the show. Most of the body work is good, but he does have awfully skinny arms, again throwing off his proportions and the overall appearance. When proportions get out of whack like this, a person just glancing at them will know SOMETHING is wrong, just not exactly what. His coolest sculpting feature are his shoes, which are very well done. Hiro also has a bit of a likeness problem, but that is dwarfed by his glasses problem - actually he's entirely dwarfed by his glasses. Glasses in this scale are notoriously difficult to do, especially something that's supposed to be thin and almost inconsequential, like Hiro's silver wire frames. Here he looks like an Asian Elvis impersonator. Behind those glasses, the sculpt doesn't look too bad, but it's so difficult to overlook them that it's a moot point. His hands work well with the sword, and he's proportionally smaller than the others, coming in at about 6 3/8" tall. The body sculpt is reasonable, although the arms seem a smidge long on him (they shortened up his legs quite a bit compared to the other men, but his arms are nearly as long). I'm hopeful for Future Hiro, where we don't have to worry about the goofy glasses. Claire and Mohinder have the best general head sculpts. Photos don't really do Claire justice, but in person she looks more like Hayden. It isn't a dead on likeness, and part of the issue is that she looks too old, sort of like a 25 year old Claire, not a current version. The body sculpt is good, and she stands fine on her own much like the others in the series. She's the shortest at 6 1/4", as you'd expect. She is also the one with the most static sculpted pose, since the articulation isn't going to do much to alter the basic hands-on-hips look. Mohinder has the best likeness of the group, looking quite a bit like the character. Unfortunately, the head is still a bit oversized compared to the body (an issue only Claire and Hiro seemed to avoid), and this in combination with his paint job cause a completely different issue. But I'll get to that in the Paint section. The actual sculpt itself captures the character well enough that he's instantly recognizable, and he stands great on his own. 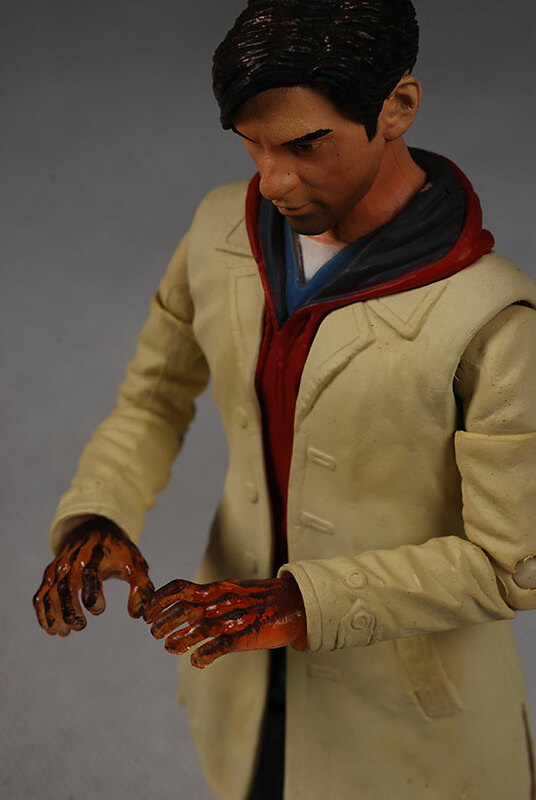 The hand sculpts are a little different, particularly the left hand, which is cupped. It allows him to hold the book in an unusual way, since he lacks the elbow articulation that would give him other options. Not a complaint, but one thing I never realized on the show - all the guys seem to love hoodies. Peter, Sylar and Mohinder are all wearing them under their jackets. I had a few more basic quality issues with the whole series than usual with Mezco. There were paint slops on Claire and Mohinder, where it looks like the painter may have had a little too much caffeine that day. Hiro suffers from poor work around the hair line, but all the rest have good hair lines. Sylar's five o'clock shadow looks reasonably good, but Peter's is much too heavy and dirty. Inconsistency seems to be the key here. All of them also have oversized, almost anime eyes, although this is the worst on Sylar, Peter and Mohinder. Sylar's eyes look a little off in the close up photos, but it's not as noticeable in person, but their oversized nature is. Mohinder has some additional issues as well, unfortunately. The skin tone between the head and neck doesn't quite match, although this is more noticeable in person than in photos. He is also very dark, with a skin tone that's more walnut tree than human. In fact, the wood-like skin tone, along with the semi-gloss finish, big eyes and slightly oversized head reminds me of one of the puppets from Thunderbirds or Team America. Once I got that impression in my head, there was no getting it out. He also has the specific issue of a paint rub on his nose, which I'm hoping is not a consistent problem. I doubt anyone expected these to have ML style articulation, but they vary pretty widely in the series between posable action figures and Nerd Hummels. On the posable side, you have Peter and Sylar. Both have good ball jointed necks with a nice range of movement, ball jointed shoulders (single pin and post style), bicep cuts right below the shoulder, pin elbows and knees, cut wrists and ankles, and V cut hips. That's it for Sylar, although he *might* have a cut waist that I just can't get freed up. His shoulders are a bit more restricted by the coat than Peter's, and Peter adds the cut waist as well as cut thighs. These high cut joints work well, allowing Peter to actually sit properly, or do a perfect Captain Morgan. Peter is the most articulated of the group, and has about the right amount of articulation for this style. He can't take any wild fighting stances, but he can do enough to be considered a full fledged 'action' figure. 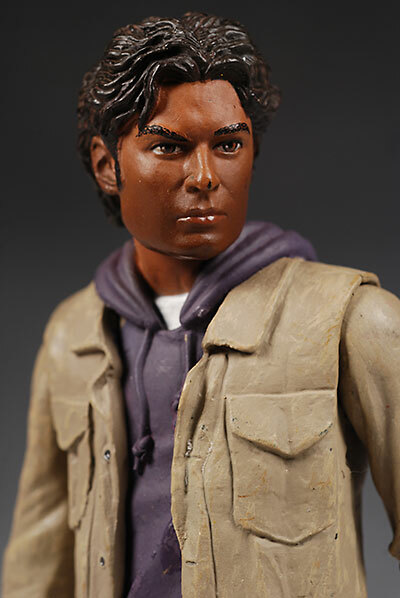 On the far end of the spectrum is the complete Nerd Hummel of the bunch, Mohinder. Okay, that's not completely fair, as he does have the excellent ball jointed neck (always a big plus! ), ball jointed shoulders (pin and post, think NECA shoulders), cut waist, cut wrists, and V cut hips. However, since he has no other leg articulation, the V cut hips and waist aren't particularly useful, and without any additional arm articulation, the shoulders can't really add many poses either. You can get him looking good just standing there, but that's about it. Hiro and Clair fall someplace in between these extremes. They both have the great ball jointed neck, but both are more restricted than the other three, Hiro by the shirt sculpt and Claire by her hair. Hiro has ball jointed shoulders, cut biceps, pin elbows and cut wrists, allowing him plenty of arm poses, but he only has a ball like waist joint, with no additional leg articulation. The waist does allow him to tilt a little, but the lack of leg articulation really hurts him here. Claire also has the NECA style ball jointed shoulders (which I call pin and post, since a post goes into the body, and a pin goes through the disc attached to this post), cut elbows, cut thighs, and that ball joint at the waist. Her waist allows more tilting than Hiro's, but the lack of cut wrists, cut ankles or pin elbows is a bit of an issue. One of the things Mezco tends to do really well on every license is accessories, and this series is no exception. They clearly know and love the show, and that kind of fan attitude helps when it comes to picking accessories. 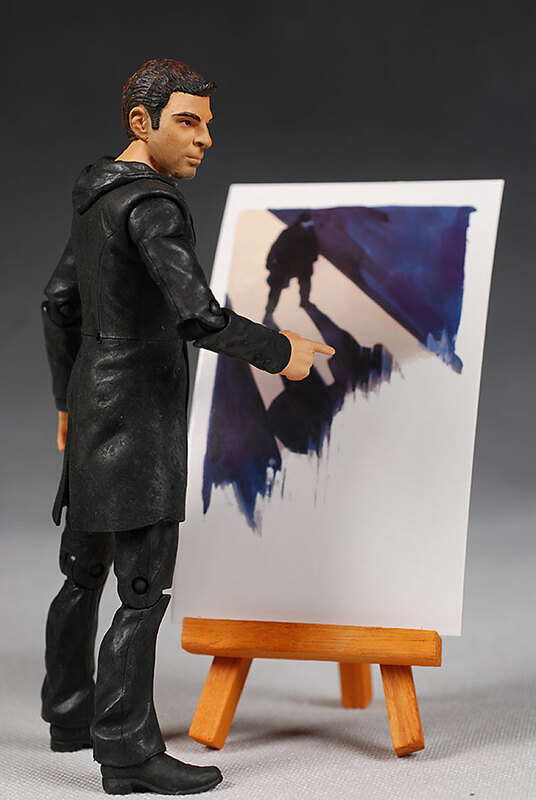 All five figures come with one of the paintings from the show. They've done a pretty good job matching the figure to a painting that relates quite directly to them, such as the 'exploding man' with Peter, or the "dinosaur confrontation" for Hiro. The portrait oriented paintings are a little large in scale, running 3" wide by 5" tall, but that's actually okay. Hiro's landscape oriented painting is 3" x 4", which is probably more in proper scale, but looks a little small to the eye. Peter also comes with his man purse, as well as a swappable set of fiery hands. These hands look terrific, and the swapping is smooth and easy, with no risk of easy damage. 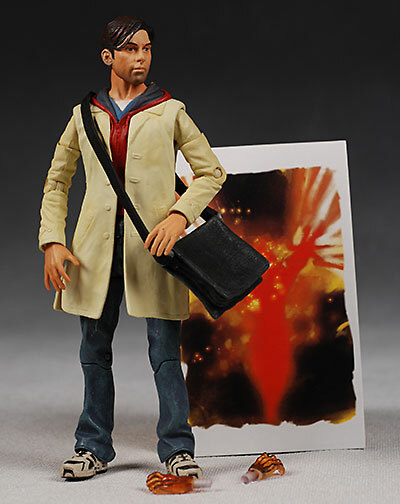 Hiro also has a man purse, and it's *almost* the identical sculpt to Peter's. The strap is shorter, and there's a slight deviation to the actual sculpt where it may have been pulled from the mold still warm and altered slightly by laying against other parts. But they are basically the same bag, with a couple stripes added to Hiro's. 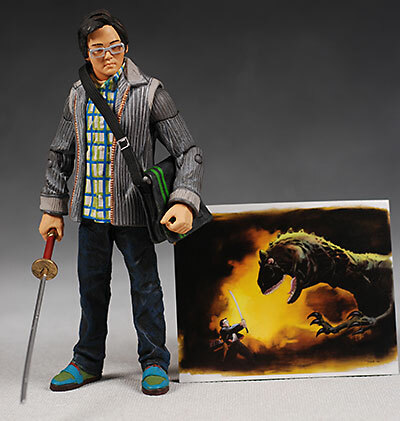 Hiro also has the sword of course, but the sculpt here seems a little off. The handle is very long, which I think they did so you could actually get it into a two handed pose if you really work at it. Had the handle been any shorter, this wouldn't have been possible. However, the long handle doesn't look right to me, and there's no sign of the symbol sculpted into it anywhere that I can find. EDIT: An astute reader reminded me that this isn't the Kensei sword, but the one Hiro used AFTER he broke that one. The long handle and lack of the symbol make complete sense - and considering how much effort Mezco puts into their accessories, it also makes sense that they wouldn't have made a mistake on the sword. Just like I never realized that all the men in this show wore hoodies, I never realized how many of them carried bags. 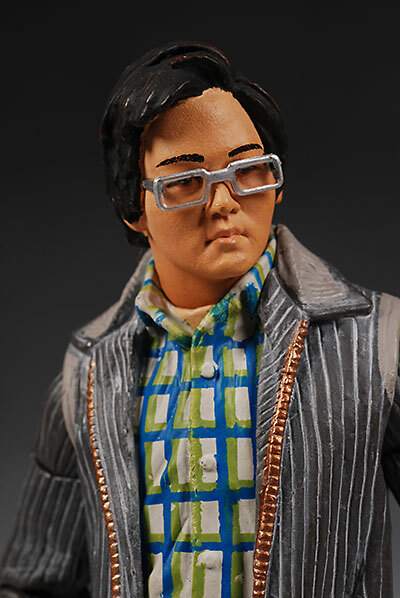 Mohinder has his as well, and his is a completely different sculpt than Hiro/Peter. The style is more professorial, less student. He also comes with a book that's supposed to be his father's work, but it has no printing, label or graphics, just a plain black book. I was pretty disappointed by that, considering the usual work Mezco does with their accessories. Claire has perhaps the coolest accessories of the group, coming with extra battle damaged body parts. In fact, I will be displaying her with the bloody head and broken arm, rather than the regular set. The arm pops on and off easily enough, and the exposed compound fracture has a nice gruesome quality. The hand is painted with what appears to be thin running blood, and this effect works well. The blood on the face is a little heavy, but it's not bad considering the scale. Some more actual sculpted damage to the face would have been nice - it's just blood that's added - but that's a minor nit. Finally, there's Sylar. He has his baseball cap that we saw him in during season 1, and it's a soft rubber that fits over his head quite nicely. I'm surprised that the separate hat looks as good as it does on him, as this is usually not the case. 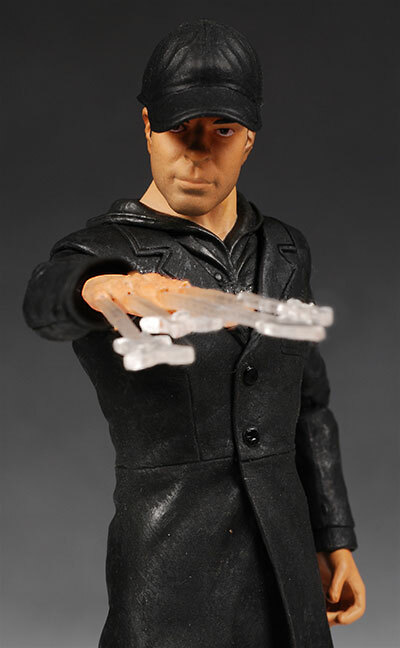 He also has a swappable right hand that is 'shooting glass' or so the package says. I assume this is from the scene in which he used his telepathic powers to throw shards of broken glass, rather than actually 'shooting' them from his finger tips. 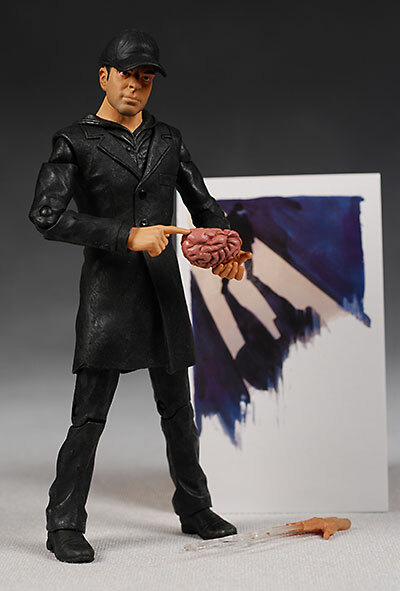 His final accessory is a brain, scaled properly for these figures. While I don't recall ever actually seeing him with a brain, we certainly know he does something with them. Mmmmmm, braaaaiiiinnsss. With a nice set of accessories, I can't really complain about these matching up with the current retail price for most licensed mass market figures. The fact that Mezco managed to get these into a mass market outlet is a huge testament to their efforts, and they should be applauded for it. I can only hope that they get rewarded for it with sales as well. Not much. Make sure you pull off Claire's left arm, not her right, the first time you're swapping. You also might need to use some hot water or the old freezer trick to free up some of the joints, particularly the hips. I really, really want to like these figures. I love the show, and Mezco is one of my favorite companies. But they are what they are, and I can't allow those bias' to alter my opinion. Claire and Mohinder are my overall favorites of the set. The Claire sculpt is better in person than in photos, and her paint job had the fewest issues. She also had the cool damaged body parts, making her the most recognizable on the shelf. Mohinder suffers a bit from the lack of articulation, but that isn't as heavily weighted for me in this overall as sculpt and paint. In fact, his head sculpt looks most like the character of the bunch, and if he hadn't had the 'puppet' issues, he would be a great representation. The others all had too many issues to elevate them above the mediocre. Sylar's paint, articulation and accessories are good, but that head sculpt just blows it for me. Hiro's glasses are obviously a huge issue, and the lack of leg articulation didn't help any. And Peter...well, he's just a mess. The only thing saving him from being the lowest scoring of the bunch is that he has the best articulation. Had his articulation been identical to Sylar's, he would have lost another half star overall. Hiro almost suffered a ** overall as well, but I think that head sculpt under the glasses is better than the glasses allow it to appear. I already have both Toys R Us exclusives on order, as well as the SDCC Future Hiro. I'm actually really hoping that the Future Hiro ends up being one of the best in the line, since he won't have the glasses to contend with. While Mohinder only gets *** overall, it's due to some very specific issues (slightly oversized head, big eyes, wooden skin tone) that tend to look worse in close up photos than in person. In fact, if the head wasn't too large, it would capture the character quite well, and had the whole line matched up in style and quality with this figure, I would have been much happier. 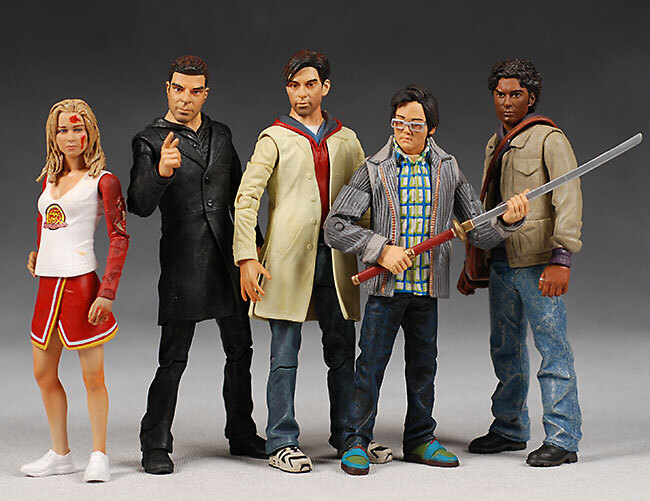 I'm hoping future figures look more like Claire and Mohinder, and less like Sylar and Peter. - Clark Toys has an excellent price if you're buying the set - just $65 for all five! They also have the singles at just $15 each. - You can pre-order the Flight Mode Peter at Time and Space Toys for $18. They also have the full set of series 1 for just $73. - CornerStoreComics has the full set for just $73, or singles at $12 each. - Things From Another World has the singles for $15.29. 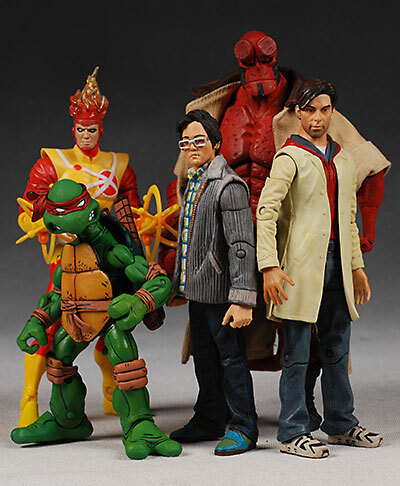 - Alter Ego Comics has the set of five regular figures for $80. - Urban Collector has them by the case for $240, which can be good if you're going in with someone else. - YouBuyNow has the singles for $19 each, or the set of 5 for $90. - Or you can search ebay using MyAuctionLinks.com. - for the UK collectors, Forbidden Planet has them at 12 GBP for the singles. Nope, I haven't reviewed any other Heroes product yet - this is the first!